Sometimes moments collide in an arbitrary way, and sometimes without the faintest inkling of what's going on, your future's entrained on a new course. Well this was shaping up to be one of those moments, and not unusually for me, it was fishing that brought it about. It was my birthday: sitting alone in our holiday home in northern France, my partner unavoidably detained back in London. Our local river, a pretty little stream and haven to boot thumping, worm casting, 'rip 'em out for the table' fisherman, was dying on it's feet in the summer's heat. Having just devoured the last pages of a thoughtful present, Charles Ritz's wonderful autobiography 'A Fly Fisher's Life', I was left yellowing with cabin fever and envy. That man had led some kind of life. Heir to the fabulous Ritz Hotel fortune, he was an immensely sophisticated and passionate Frenchman who had the time and resources to scour the world for his fishing pleasure - and pretty much to the exclusion of everything else in his life, that's exactly what he did. But in the end, doesn't it always come down to a question of where the heart lies? And in his case, that special home water he kept returning to was the river Risle in Normandy. To quote from Ritz's eulogy.
" The finest and richest reach of the Risle is undoubtedly that of Aclou. I think it is the finest in the world and better than any reach of the Test, Itchen and Wylie". Now you have to say that's a pretty ambitious claim. So nothing else to do I dug out the maps. And that's when the moments collided. 'Aclou' lay not a 150 km from my front door. Now picture a meeting with a total stranger in a pub in Stockbridge and him actually pleased to offer you a prime stretch of the Test, and at a cost next to nothing. Impossible, you say. Well not in France, my friends. The next afternoon I found myself in the bar of the Hotel Soleil d'Or, deep in a Normandy Valley. My companion over coffee and Calvados was the charming Bernard Rambaud. I'd managed to contact him through a Normandy fishing brochure I'd once filed away for future reference. And to my amazement, Bernard turned out be the proprietor of a 3 km stretch of double bank fishing on the Risle. Ritz's beloved Aclou just a couple of kms downstream. Bernard managed to stuff a slathering tongue back in my mouth, suggesting we take a trip to the waters before making up my mind (I think it was his chance to check me out a little, too) So, 5 minutes of following Bernard along the valley road and I was driving through the fisherman's entrance to the Rambaud family domain. Behind the gated fence lay a seventeenth century barn, part of which had been converted to a comfortable fishing lodge. And beyond the cow grazed pastures - the banks of the Risle. When Bernard showed me the catch book I was surprised to see how little the river had been fished in the past few years. Just family and the odd visit from Parisian angling friends. But their catch rate certainly looked impressive, and with sizes up to fifty five centimetres. Lots caught on sedge and something called a Pont Audmer? Bernard gave me one from his box. I thought it looked like more like the gaudy cockade on a French Dragoon's helmet than the delicate up-winged insect it was supposed to imitate. But then I always distrust a fly until I've caught with it. It's part of the territory that comes from a novice's lack of self confidence, plus a niggling urge to keep changing the offering. Bernard didn't have time for us to walk the whole stretch but his précis was more than enough to take in. Standing central to the domain was an area which included two very interesting wooded islands - the sparklings of a snaking little riffle dividing the two. Downstream, about 1.5 km of main river, which from our distance looked broad and heavy, but Bernard assured me there were many interesting shallows and bays to be fished. Up stream, his own private stretch, and below it, a good 200m of lively runs, topped and tailed by shelving pools. It was certainly wonderful, and rather daunting. Just too much information but I retained what I could. Bernard left me with the keys to the gates of his kingdom along with an invitation for drinks at his home the following evening. And driving the valley road back to my hotel, as I mulled on the following day's prospects - the realities of life started creeping back in. Now you've got to understand that in those days I was just an average fishing nut with a limited experience of rivers. The few beats I'd fished on chalks streams were in scale mostly cosy and comforting affairs, with a good clarity of water. But I'd been surprised by the size and nature of this stretch of the Risle. It wasn't much like any chalk stream I'd ever cast on. I'd found a lot of the water dense and difficult to read. And although we'd spotted a few holding fish in more penetrable areas, I felt little indication they had much appetite for a feed. This nagging quotation from Ritz's book kept running through my mind. "When I finally learnt how to fish for trout, it was on the Risle. When you can take fish there, you can take anywhere" Not exactly the balm of inspiration for a wobbly confidence. Around seven the next morning I'd given up fighting a fitful night's sleep and was taking a coffee in the breakfast room. Like all those privileged to fish a trout river from their own front door, Bernard had tactfully suggested that the evening rise was the cream of the day's sport, and I might like save my energies for that. But how do you constrain a starving man to just an evening course, when he can gorge on the banquet of a whole day? I hit the banks in my usual fashion, armed with the last fly I'd used on a previous trip. And there's another example of my shortcomings. I always try to avoid de-rigging my tackle. I know it lacks ritual and practical purpose - but what can you do? The first section I encountered was the longest on offer, and at it's broadest, about thirty metres across; too deep to wade in hips boots, and eddies and strong pulling currents would play havoc with any long line. So now I was trailing the herbage for signs close in and after half an hour or so of wandering, I found what I'd come for. Under the shifting shadows of a low willow overhang - dull golden flanks ascending from a weed bed, nosing and sifting the river for food. No discernible fly life, so I gave the black gnat an airing. I didn't managed to put him down until the fourth cast - but at least he'd shown a quiver of interest at one of the efforts. (I'll take any victory, no matter how small) It was a good hour before I spotted my next fish, or rather the muddy boil he left behind to mock me when he'd shot from the margins at my approach. He'd been stationed just down river of the confluence with a small feeder stream, which by far was the prettiest part of the stretch. It was here that I'd shared a poignant, muting moment with Bernard the previous evening. He'd told me it used to be his son's favourite spot. And now I guess it had become an aide de memoir. His son had died tragically a few years earlier whilst still in his prime. I wonder how many more ghosts of times un-remembered must be haunting those banks. But now the river was getting more interesting. I'd arrived a point where it bottle-necked to shallows before spreading to encompass the Islands - and that's where I felt I had my best chance. Most of the waters alongside the Islands were wadeable, so I could work upstream prospecting under their inviting overhangs or back to the undercut banks. Much better than the deep daunting water that had dampened my spirits for the last couple of hours. Then for one of the few times in my fishing life, I actually walked the waters I was going to fish in, first. I can hear the sighs. What kind of fisherman is he that stumbles blindly into battle? The over excitable type, that's who. But it did it, and unbelievably, I even walked away from it too. It was around noon and already an average dog day in August. So why be lacerating the waters of a dead river in frustration when I should be saving myself for 'la creme' Plus, I was up for a spot of sleuthing. 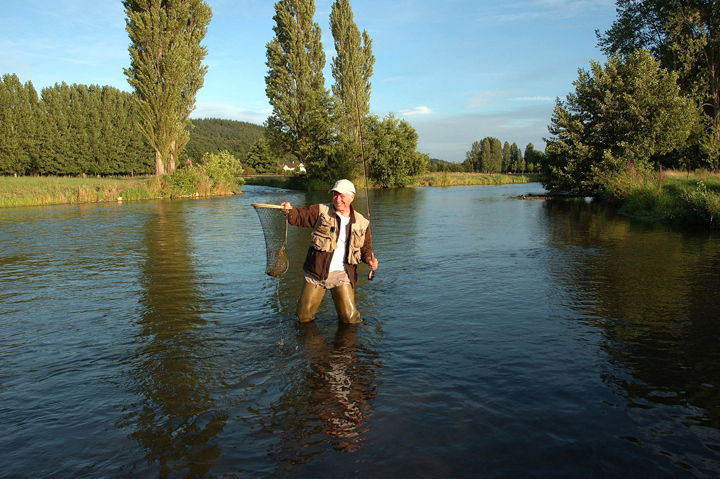 So I followed the main river road down to Monteford sur Risle, stopping at a few likely bars along the way - they're usually a good source of local fishing information, some selling permits and day tickets for public waters. But not much luck: no more strangers with family treasures, willing to unearth them for my view. But I did find a lovely riverside Auberge in Monteford where I satisfied my craving for a steak, frites and salad on a terrace overlooking the river. Around 5 in the evening I was back at the bottleneck, buoyed by a refreshing breeze and the huge calvados that had tailed my long lunch There was even the beginnings of a high fine cloud to diffuse the still harsh rays of the sun. I picked a path into the cooling waters and stood a while to collect my thoughts. Funny how it is when you're feeling confident - alcohol induced or not - but the river in front of me had an altogether different complexion. It felt alive, and for the first time that day my adrenaline was on the rise. I'd even spotted a few pale olives dancing in the tree-filtered sunlight - so I had a point of departure. Casting to a fishy looking weed bed just downstream of the Island, I got an immediate response. My knee-jerk reaction produced a tightening and I was in to my first Risle trout. It couldn't have been more than 25cm, but from the fight that he gave me he obviously wasn't aware of his size. What a start - hole in one off the first tee. But we all know what sporting Gods are like, and it was back to double bogeys. Still no signs of rising fish, and missed two unannounced offers. I took a break on the bank side for tobacco and a survey. The sun was on the dip and the waters alongside the Island were mainly in shadow. Midges and sedge were making an appearance along with the olives. Dithering as usual when faced with choice, I tied on a cul de canard emerger in the hope they might fancy something French to eat. 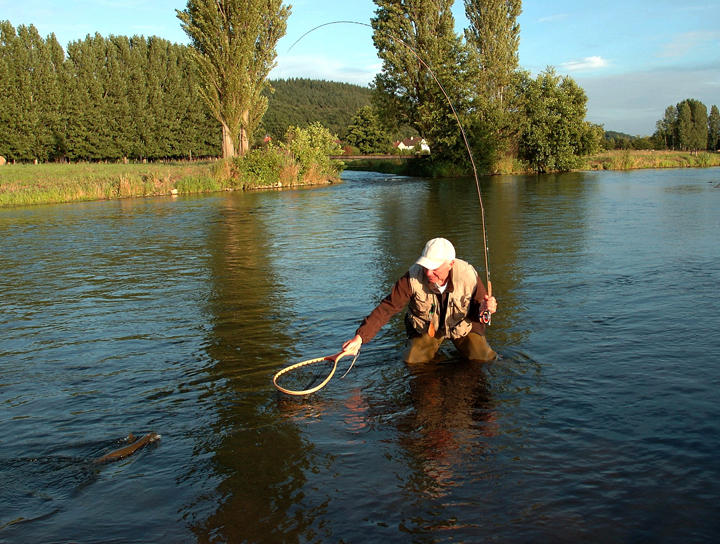 I cast to a small pool at the tail of the riffle dividing the Islands and misjudging the flow, I was fighting to retrieve slack when a fish rose to engulf the fly. The rod shot up, the line went tight, and this time there was a dogged two pounder on the end and punching every ounce of it's weight. One of the things I love most about wading in rivers is sliding a fish to thigh and unhooking it in it's own environment. It was a joy to watch that beautiful brownie flashing away untouched by net or human hand. "When you can take a fish from the Risle - you take fish anywhere" Well now I’d two, and I was feeling chipper. Yeah, okay – dream on. But it was a nice thought while it lasted. And I did managed one more before I finally gave the water best around nine thirty. If the first two had an element of luck attached - this one was a complete fluke. I'd given up trying to tempt them with the dry and in the absence any real signs of a rise, I'd resorted to a little nymphing. I knew it was probably bad form, but river or not, I have to admit I'm partial to a nymph - especially a hare's ear. I was a few feet out into the river and pitched the nymph into a clear gravel run. It was just reaching the tail when the electric blue of a Kingfisher shot clear of the wooded Island. Nymph forgotten I watched in pleasure as it zeroed upstream to disappear round a curve at the end of the stretch. Retrieving the neglected line now trailing behind me, I tightened into what I thought was a snag and turned out to be a fish. It fair leapt out of the water and it was a toss up as to whether fish or angler was more surprised. But I managed to keep contact and slid another lovely wild brownie to thigh. What was it I said about sporting Gods? Well that was it: it may be dragging down the average catch rate but I was settling for entering my three in the book. I made it back to the hotel just in time to take a phone call from my partner. Her plan was to head back to our farmhouse the following day. It's amazing how prescient women are - she seemed to know my mind almost before I did. It was only during the long pregnant pause preceding her reluctant agreement to join me in Normandy, that I came to realise I was now on a mission. Two years on and we managed to acquire our own Normandy home home where we’ve lived happily for the last twelve years. . Unfortunately I can't boast a river but that's by no means a complaint. 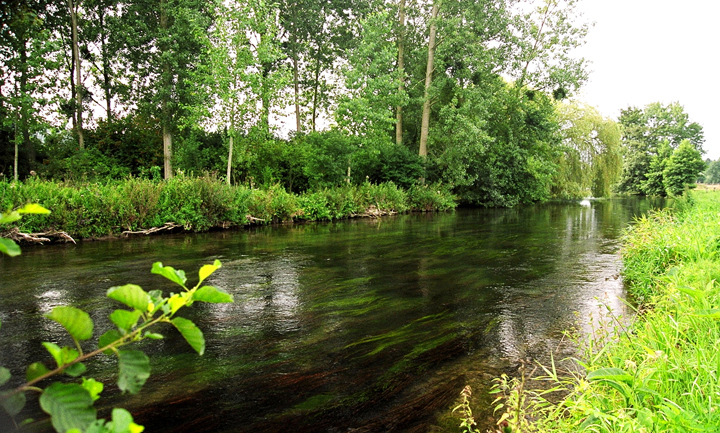 Within an hour's radius, I can fish for grayling and trout on the Iton, Charontonne, Orbequoise and Andelle. Plus a good seasonal run of sea trout on the public waters of the Touque. And then of course, there's the magical Risle. But if I do have a complaint about Normandy, it's the clarity of water. It's less than you’d expect from our own southern chalk streams. But what the hell. If it was good enough for Ritz, it'll certainly do for me. That is until, maybe another of those fishing and life moments collide.